Read this book and you will be more thankful and even proud to be part of the human race from which this woman (and her husband) emerged. Becoming will assure you that not all figures in public life are professional liars, fakes, thieves, sexual bullies, and assassins. 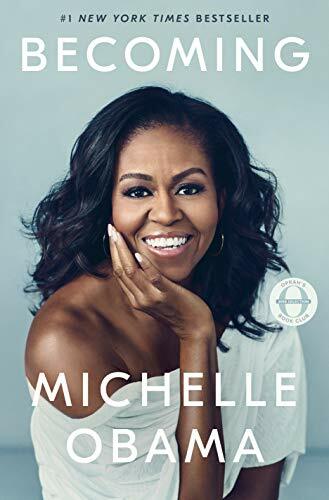 Not forgetting the many shortfalls in American life, past and present, you will be happy to learn how Michelle, helped by devoted and upright parents, created opportunities from a very problematic milieu, one from which many other persons sought relief in drugs, gangs, guns, and self-destruction. The culture into which she was born and developed contained huge positive potential as well as many destructive tendencies. Michelle’s story only hints at the difficulties she experienced in her 54 years. She and her older brother Craig grew up in South Side Chicago. Michelle Robinson had to take a 90-minute ride, standing much of the way, on two buses to reach and later return from a better school than available close to her Euclid Avenue apartment. Her father and homemaker mother saved money for their two kids’ future by renting a second-floor apartment owned by their aunt Robbie, a piano teacher whose pupil’s repetitions of “Hot Cross Buns” penetrated the walls day and night. Michelle’s older brother was his high school valedictorian class but made it to Princeton by playing basketball. To pay her tuition at Princeton Michelle pasted book covers one summer, put in ten hours a week as a work-study student, and took out loans that burdened her for years. Having acquired a law degree at Harvard, she returned to Chicago’s South Side to work at a prestigious law firm in Chicago. Not liking that job, she then gave up her lawyer’s salary and perks to work in city hall and then to lead a nonprofit called Public Allies, which aimed to help kids learn about and exploit the kinds of opportunities she had discovered and used. Harvard law student Barack Obama showed up as a summer associate at the same law firm where she worked. Soon aware of each other’s qualities, Michelle and Barack sustained their relationship over two years while he finished his studies at Harvard. When he returned to Chicago, however, she experienced him as a hermit studying for the bar exam. Despite being a people person, she eventually agreed to live with a somewhat introverted intellectual who, ignoring his own and his wife’s reservations, plunged into social work and politics—“yin and yang,” as she saw their inner selves. She for order and stability, he for risk and adventure. Following their honeymoon in northern California in 1992, she lived without him for six weeks while he went to Bali with many yellow tablets on which he scribbled Dreams from My Father (published 1995). She then endured another set of absences when, elected to the Senate of Illinois, he spent long periods in the state capital, Springfield, from 1997 to 2004. While Barack traveled back and forth to Springfield, Michelle suffered a miscarriage and finally had two baby girls by in vitro fertilization. Her autobiography only hints at the difficulties she experienced in her 54 years. Even though turned off by the dirt and pettiness of politics, she tolerated and then helped Barack’s campaign for U.S. Senate and then for the White House. Michelle appreciated Barack’s potential and wanted to help him fulfill it. When Barack campaigned for president, she developed a stump speech that started with a loose structure and no teleprompter or worry if she went off on a slight tangent. For perspective on Becoming, consider two other books published in 2018. Empresses of China’s Forbidden City, 1644–1912 (Yale University Press) and John Kerry’s Every Day Is Extra (Simon & Schuster). Except for the last dowager empress, all the Qing dynasty empresses were honored but kept apart from the business of running an empire. Each served as a symbol reminding everyone of her son’s filial devotion. John Kerry’s book, on the other hand, is the story of a man in perpetual motion accustomed since childhood to interacting with the upper classes of Europe and the United States, driven in limousines from one mansion or prep school to another. He skied at Davos as a child long before arriving there as a leading politician. He returned from the Vietnam War to demand peace; become a Massachusetts senator, 1985–2013; compete for the presidency in 2004; and serve as secretary of state, 2013–2017. Kerry became an instrument of Obama’s foreign policy and served the same White House where Michelle was FLOTUS. She and Kerry each played a key role in the Obama administration. Each got there by a very different route. Michelle and Barack tried to expose their daughters to the positive features of life. When POTUS visited the Kremlin and the Vatican during a school vacation, Sasha and Malia met the Russian president and Benedict XVI. When Sasha returned to the third grade, her writing assignment was “What I did on my summer vacation.” She wrote: “I went to Rome and met the Pope. He was missing part of his thumb.” Michelle did not notice this but allowed that this might have been the insight of a waist-high view. One of her most “political” activities was to promote programs for girls’ education worldwide. She did a Carpool Karaoke with James Corden singing “This Is for My Girls” that achieved at least 45 million views on YouTube. Having practiced diligently for weeks, Michelle concluded the effort had been worth it. Michelle Obama has fulfilled the ideal of an American dream. She is great great granddaughter of a slave born in 1850, perhaps a descendant of a master-slave relationship, child of a hardworking father and home-making mother in Chicago, graduate of two Ivy League institutions, corporate lawyer, and leader of a nonprofit agency. A skeptic about politics, she married and helped sustain a major politician. She is the humanist ideal—in every respect a profound contrast to the current president whose every word, deed, and smirk represent the denial of that ideal.